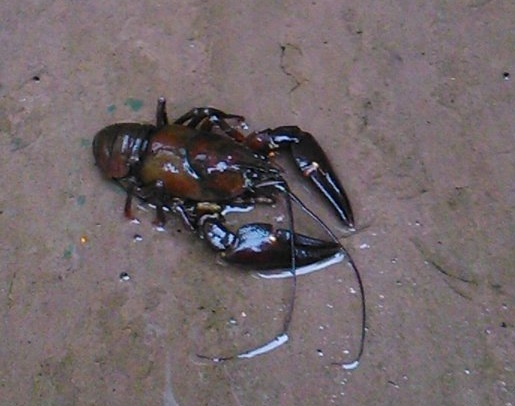 Apparently crayfish are roaming the streets somewhere relatively local. I've not seen them myself, but can anyone give a confident ID? they are quite tasty but you are supposed to have a licence to catch em which helps avoid mistakes with the rare and endangered local ones ,iirc tis about �50 which is a bargain if there are quite a few . Last I checked, you needed a licence to trap them. Catching them by other means is fine. "Oim sorry yer honour, Oi thought 'e were a woodlouse..."
It would be a pretty blind judge who would belive that. You need to find a better match. I think it a fairly good defence to think they are no kind of fish, if you find them on the lawn or in the woods. What colour are the claw undersides? They're across town and I've not seen them, but the general consensus is that they are the signal crayfish. The question now is what to do: whether to just grab a few for the pot, or whether it worth a more concerted effort to round them up. Lady is going to ring the EA on the morrow. a few is barely a snack,they do freeze well .just make sure the bucket has a solid lid or pop em in a sack to avoid them hiding behind the peas before they chill ,quieten and expire gently.